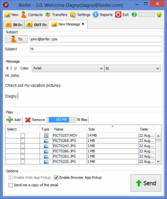 Binfer is a file transfer software for sending and receiving large files such as videos, pictures & documents without uploading them on any servers. Fast, easy to use, practical & time saving alternative to website uploads, email attachments & FTP. Surf anonymously with free secure VPN. Hide your IP address, and unblock websites, all for free with SafeIP. Stop ads, cookies, and malware, while using our proprietary Browser Fingerprint anti-tracking technology. Available in 26 languages. Arovax SmartHide encrypts all internet traffic and secures all user's internet protocols.